Mom thought it would be a good idea if I had a bath first. You may remember reading about my unfortunate previous experience with the B-word after I was skunked. I’m much better now. And, since I think anything having to do with me is incredibly fascinating, I thought I’d share some pictures of my bath this morning. This will give Mom plenty of time to pack the car since we’re leaving in about 12 minutes. My bath is really a shower and Mom takes her shower at the same time. You don’t get to see either of us naked. (This is a family blog.) But here I am wrapped up in my towels. (Can you see my nose?) I have to wait in the tub after my “shake” (not the handshake kind I do with my front paw, but the kind where I spray water all over everybody). Mom keeps the shower curtain closed and I know to do it on command INSIDE the tub. So after we’re done and Mom dries off, she wraps one towel longways over my head and back. Then another towel goes under me and around my middle. I stand there patiently until I am mummified. Then I step gingerly out of the tub. After all, I can hardly see out of the towel and I might slip on something. 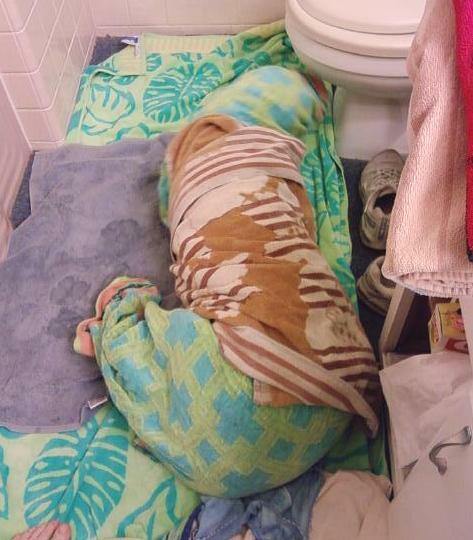 Mom has put the big towels all over the floor of the bathroom before we start. This is the international sign for BATH. 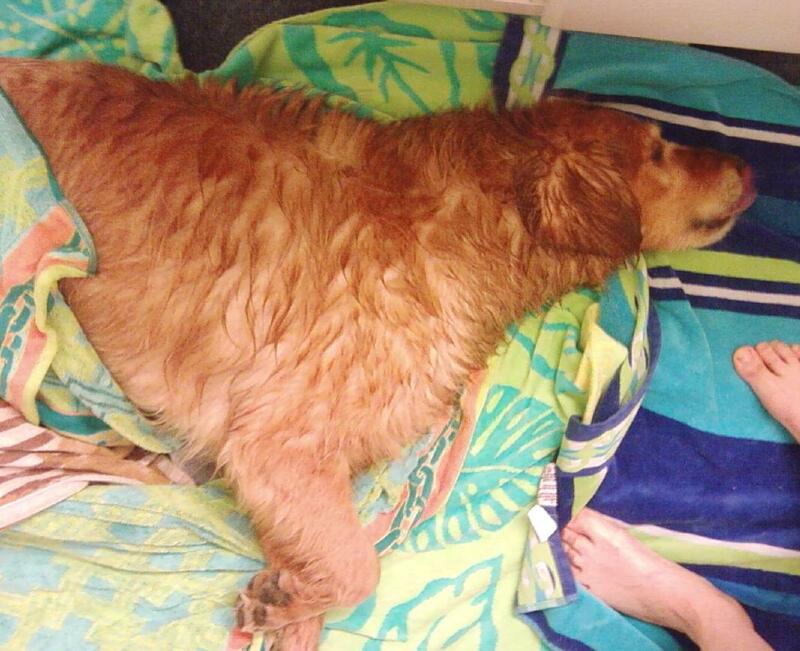 If you’re a dog you should put your tail between your legs as soon as you see this many towels on the floor. Your human is NOT doing laundry. So, after I get out I lay down and rest. Bathing is hard work. There’s all that standing there doing nothing while Mom bends over shampooing and rinsing, rubbing and rinsing, cleaning my hair out of the drain and rinsing. And then I have to wait around while SHE shampoos, soaps, and rinses. Sometimes she has enough time to shave a leg. Then I rub my head on the floor, which is why the towels are there apparently. I pump my legs and push my head along the wall and under the cabinet. If I had the room I’d go in circles and make pinwheels. I find this invigorating and it’s how I get out of my mummy wrappings. And then I lick every possible part of my body to remove the annoying clean smell left from the shampoo. By this time Mom is dressed, smeared stuff on her face, and wants to plug in the hair dryer. That’s my cue to escape. I don’t know if it’s the hot flashes or the steam from the shower, but she always open the door. And I’m outta there…! I then become a walking whole-house humidifier. Looks like we’re ready to hit the road. Mom says I smell good enough to ride up front with her. See you in Indiana! Entry filed under: AAQI News, Dog Stuff, From Under The Desk. Tags: bathing a dog, helper dog. Madison, what a great dog you are!!! I have to take my dogs to the groomer to keep from having hurricane Lady and Buddy in the house. Little Sam the elderly Pommeranian gets haircuts, so he has to go to the groomer. Lady is a golden retriever and Buddy is a chocolate Lab. Lady is wonderful, but Buddy is still young and very, very enthusiastic! Madison ~ thanks for sharing the tale of your bath. You are SUCH a good dog!! Madison, Madison – have you not learned to read minds? My Mom hasn’t yet managed to get me in the bathtub by herself. Bath is a 4 letter word you know. As soon as it starts to form in her mind I’m outa there. She’s gotten very sneaky though – now I get a car ride and all of a sudden I’m at the vet – which is where the groomer hangs out – not fair if you ask me. It’s OK though – as soon as I’m home I find some smelly stuff to roll in so I smell like a dog again. Madison, my Maestro and Gretzky had baths just like yours! 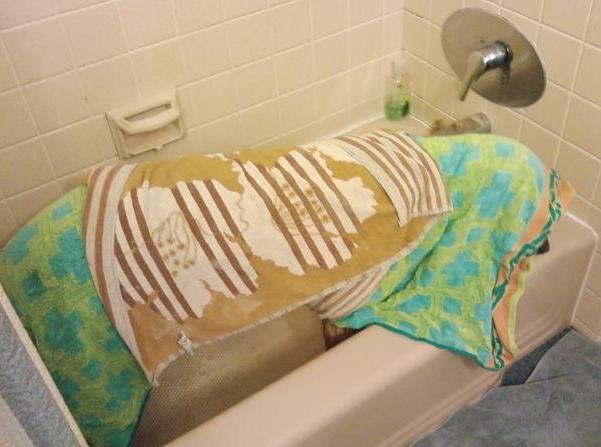 And, just like your bathroom, ours was covered with towels, too. It is a universal sign of “big, furry animal” bath to come. Golden retrievers don’t fit very well under a bed, but if you can manage to escape to the far corner of the basement, I seem to remember a big washtub down there you might fit under. Hold perfectly still, and your momma might not see you. I love Madison. We can’t have a dog because of allergies so I love his chats!! Keep them coming Madison. Madison, my Mom said she would help me send this to you. I am kind of new at this bath thing because I’m not quite a year old and still think that all the towels on the floor are for playing with while she takes her shower! Have fun on your trip and be sure to share any hints about traveling with her when you get back to your Mom’s computer. Whenever I start to feel blue, I thing I will just come back and read this entry (or maybe any entry) “written” by Madison. It always makes me smile, big time!!! Thanks for that, Madison. Would love to meet you someday in person/animal. I’ll bet you are a joy to be around …. except after the encounter with the skunk! Have a great trip and take good care of Ami. Whenever I start to feel blue, I think I will just come back and read this entry (or maybe any entry) “written” by Madison. It always makes me smile, big time!!! Thanks for that, Madison. Would love to meet you someday in person/animal. I’ll bet you are a joy to be around …. except after the encounter with the skunk! Have a great trip and take good care of Ami. Madison, you make an awfully cute mummy! You also make taking baths look not so bad, looking at that last picture! I’m not sure if my huskies would handle being wrapped up like you do! My mom and I shower together too. I love it. If she isn’t really fast shutting the door I can get in the shower no matter what. I can open the door and climb right in. 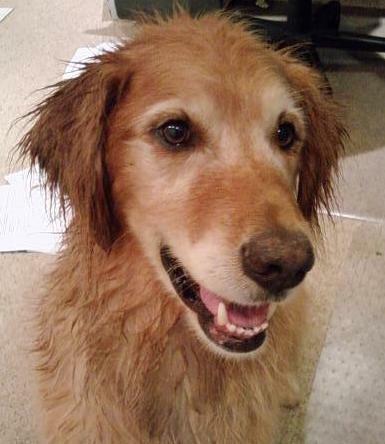 I haven’t mastered shaking on command–I try to escape before she dries me with the towel. I have really short hair (I’m a bulldog) so it isn’t too bad when I shake. BTW, my name is Molly! We must be related! I’m a golden too! I do all of the same things that you do like scootching around the floor after a bath. Isn’t it fun! If I escape, I run upstairs and scootch on the carpet up there, downstairs is all wood floors – not as fun. I have a brother and a sister, but they’re Chihuahuas. They get baths in the kitchen sink. Doesn’t look nearly as fun. They have no way of escape once mom gets them from under the bed! The kitchen counter is about 10 times their height – kinda like if we were to jump off of a roof! Madison, you are quite talented. I would love for you to give Hannes lessons on shaking when commanded, you are one handsome pup! Madison, You make my day! Your Mom has such a good idea about mummification. 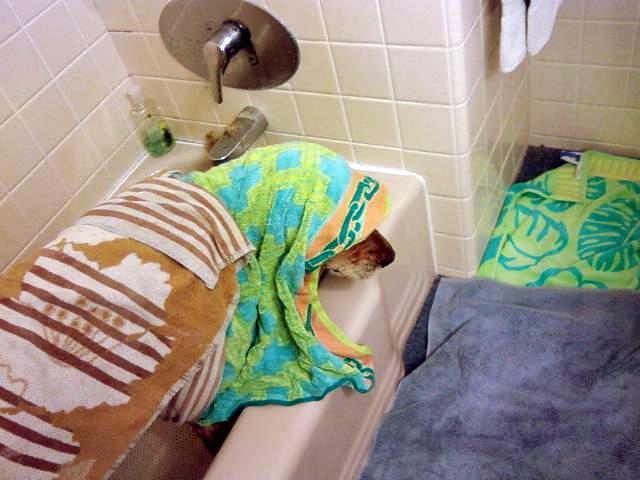 The only problem is that Max and I (Roxie) are Rottweilers and too big for most towels. I love getting a bath and hold real still for Mom. Then Dad dries me off with a towel. Max hates a bath and cowers in the corner of the shower and then heads out and runs into the living room to dry himself off on the carpet. He isn’t trained very well. Dad keeps saying that he is going to train Max to be a therapy dog (Max is 10) and Mom says he is too old. I am only 8 so I still have a chance. Max and I take care of Dad while Mom is at work. He was hurt at work and stays home now. It’s great cause we get to go out any time we can wake him up. He sleeps a lot cause he hasn’t anything to do. Wish he would start quilting like Mom. I had my very first road trip in May. We visited Michigan and had a lovely time. I learned that I can jump at the window in the back seat and scare the heck out of all the on coming cars on a two lane road. It doesn’t work very well on the expressway, so I don’t bother with that. Max just looks over Dad’s shoulder through the windshield. I don’t get why he does that??? Jumping is more fun. Say hi to Ami and keep blogging. Roxanne von Shelton with a little help from Maximillion von Wright and Mom (Karen). P.S. Max here and I am well trained! I just don’t like getting wet. It’s been nice to re-read these blog posts. I wish you’d start blogging again.